It is past the registration date. Can I still join USA Fit? Registration varies from chapter to chapter, and some chapters have registration intermittently throughout the year. Please contact your local chapter to find out specific details on registration. Drop-Ins varies from chapter to chapter. Please contact your local chapter to find out specific details on registration. However, our all-inclusive membership covers our seminars, coaching, and training runs/walks. 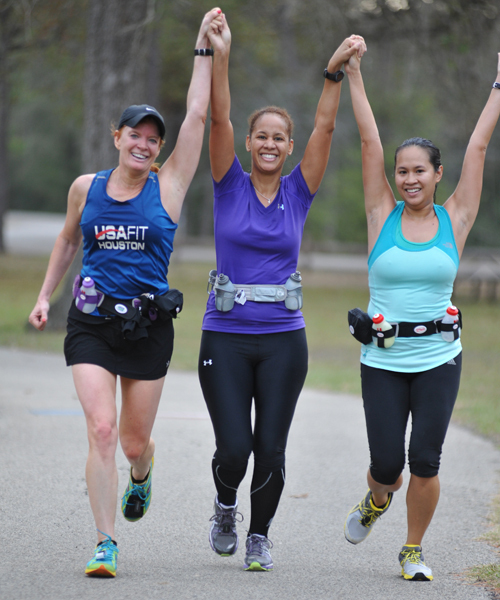 USA FIT is group walking and running training programs that are dedicated to changing lives. USA FIT chapters are available nationwide. How do I find my USA Fit chapter? Visit the locations page and plug in your zip code to find the nearest chapter to you. What if there is not a USA Fit chapter near me? USA FIT offers you the ability to start a chapter. There is no financial requirement of any kind – just the desire to offer the USA FIT program to others in your area. If you are interested, please contact us. USA FIT is perfect for anyone! Everyone who has a desire to challenge themselves, and wants to exercise, make new friends, increase their body strength and stamina, look and feel better, or get involved in a healthy lifestyle sport, is invited to join. When do the USA FIT seasons run? Each chapter has a specified season - please contact your local chapter for details. Each chapter has a specified training location – please visit your chapter’s website or contact your local chapter for details. YES! Walkers are an integral part of our programs. Most chapters offer dedicated walking program that will enable members to complete a target marathon, half-marathon or other race distance. USA Fit is not affiliated with a charity, and you do not need to raise money for a charity to participate in this program. Some of our members may choose to raise money for a charity, but it certainly isn’t a requirement. It all began in Houston more than 28 years ago with 50 runners, two guys, and an idea that runners needed some guidance and training to achieve their marathon goals. How will I be grouped for training? USA Fit groups members based on ability, and there is a group for everyone. Each chapter has different ability-based groupings which works very well because it allows members to train with those who are at a similar pace and ability level. Please contact your chapter for details. Why should I walk or run my one or two-mile time trial slower when I can go faster? Simply because you are training for a marathon, not a one or three-mile race. Walking or running too fast will seriously compromise your training season. If you find your correct training pace from the beginning, you will complete the marathon in less time, you will experience fewer injuries, and you will have a lot more fun. Most weekends, after the group run, we’ll hold a 15-20 minute educational seminar. Topics will all be health- and fitness-related and will be led by industry professionals. We run or walk with our groups before after each seminar. For most chapters, the seminar will start at 8 a.m. every Saturday. After the seminar, some chapters have their members meet with their designated training groups for a few minutes to talk with the coaches, ask questions, and make plans for the next week. Before the weekend, members will be given the starting time for their training group (this information is also available on the chapter’s website and in the e-newsletter). All chapter’s schedules come from the experts at USA Fit. For over 28 years, USA Fit has been training people all over the country. There are many different marathon philosophies, but the USA Fit philosophy has been tested literally tens of thousands of times and it works. Do we get any discounts or freebies? USA Fit chapters have loads of local sponsors who provide discounts on shoes, clothing, running gear, and many other goods and services. Please contact your chapter for specific details. Program cost depends on the chapter’s program length and season. Please contact your chapter for details. Most chapters host in-person registration at the beginning of the season. Watch your chapter’s website and Facebook page, and sign up for the newsletter for specific registration dates. Please contact your chapter for more details. Sessions vary from chapter to chapter so please contact your chapter for details. Yes - during registration, you may register online by clicking on the red “Register Now” button at the top of the chapter’s website to pay with a credit card. Most chapters cannot accept credit cards at the in-person sign-ups, so if you want to use credit card, please sign up online. For in-person sign-ups bring cash or a check. Do I have to attend both orientation sessions? If possible, we’d like you to attend both sessions. Please contact your chapter for details. Yes, you should still sign up! Your coaches can help fill you in on what you missed. Does entry into USA Fit include entry into any races? No, your payment to USA Fit only covers the cost of your participation in the training program. We are not affiliated with the target marathon - we just train for it. Information about how to sign up for a target marathon and other races will be provided. Realizing that most people lead very busy lives, this program is one that can easily fit into your schedule. For the most part, the program calls for running or walking only four days a week. Your long run or walk will usually take place on Saturday with your group. The day after your long run/walk is always a rest day. During the week, you run or walk for time only (i.e., 30 minutes), not for distance. What does “20” on the weekly schedule (during the week) mean? Are we running 20 miles? During the week, we run for minutes. So if the schedule says “30” on a Tuesday, you should run or walk 30 minutes. Do this at a comfortable pace unless instructed to do otherwise. On the weekends, we do miles, so the schedule will say four miles. Listen to your coaches for guidance on running these miles each week. While those long runs and walks are a lot easier when you’re doing them with the group, we know there are times when you won’t be able to make a weekend meeting. The seminars are important, so be sure to speak with your coach or running buddies about what you missed. In our experience, the success of our members is directly proportional to their ability to attend our weekend trainings. If you do have to miss a week, check this website for the next week’s schedule. Sure! In fact, we target specific races as a group so that you can experience the fun and excitement of a race with your training buddies. You certainly don’t have to be competitive about it, but it’s fun to run or walk in a different place, get a race number, and cross the finish line. What if I travel during my training? Can I attend USA Fit programs in other cities? Absolutely. USA Fit has programs in ~40 cities around the U.S., and you are welcome to attend any USA Fit meeting anywhere. Of course you could. However, most likely you’ll get a nice T-shirt, a finisher’s medal, bragging rights, and a lot of cheers from spectators and coaches. Contact your local USA FIT chapter via email or email us at USA FIT at info@usafit.com.